Upon first glance, the 15th edition of Commando Comics published in January of 1945 may seem like an innocent comic meant to entertain and delight Canadians during a tumultuous time during World War II. However, after further examining its propagandistic subtleties scattered throughout this issue, it becomes clear that these comics were not simply blatantly racist and nationalistic but were a result of and contributor to the anti Japanese and German-phobic ideals that were being perpetuated throughout the allied nations during WWII. By portraying certain depictions of the enemy meant to represent an entire country of people, the 15th issue of the Commando Comics helped feed into this notion that all of the Japanese and all of the German people were inherently evil and inferior, whether they were directly involved with the war or not, ultimately giving rise to racist sentiments throughout the allied nations. It was in the early 1930’s that the comic book industry really started to gain ground as a mainstream source of media and entertainment. With the release of Action Comics No.1, which featured the now iconic hero Superman co-created by Jerry Siegel and Joe Shuster, the popularity of comic books continued to rise, subsequently inspiring others to contribute their own costumed characters to the growing industry (Bell). In 1939, despite the outbreak of war overseas, the comic book industry continued to rise in popularity and began to spread throughout Canada. However in December of 1940, faced with a country that was experiencing the demands of a war economy and a growing trade deficit with the United States, the King government passed the War Exchange Conservation Act, effectively putting a stop to nonessential goods being imported into Canada, including comic books (Bell). Taking advantage of these war time restrictions, multiple Canadian publishers began to distribute their own comic books featuring uniquely Canadian superheroes; one publisher being Bell Features who was publishing more than 100 000 comics per week, including Commando Comics (Bell). Throughout war, one of the driving forces on any home-front has always been to instill and call upon nationalism throughout that specific nation; to gather support, to help with enlisting, and to raise moral throughout a country during an extremely difficult time. It was no different in Canada during World War II. The Canadian Whites collection were simply a more disguised form of propaganda meant to rally nationalistic sentiments throughout the country, as are most Superhero comic books. Although comic books simply seem like an appealing children’s story that are based on childhood superhero fantasies, they are usually a more complex, nationalist allegory (Heet). The Superheroes that Bell Features were publishing were nationalist ones who really spoke to Canadian’s pride and belief that they were essential in defeating Hitler and the Nazis. Johnny Canuck for example, who appeared in several Bell Features comics, continuously fought and overcame Nazi oppression and was crucial in the destruction of Hitler’s war material factories, all the while being praised by Winston Churchill who was in awe over what this Canadian hero was achieving (Heet). This nationalistic depiction can be seen throughout the 15th edition of the Commando Comics as well, in the way that the Canadian heroes are drawn and displayed. In The Young Commandos, written and illustrated by Jerry Lazare, the young heroes are drawn as very handsome, tough, muscular men, embodying the most positive physical characteristics that Canada would want to see in their heroes (10-15). These characteristics used to positively depict Canadians can be seen in other stories throughout this edition; including Chick Tucker, written and illustrated by Alfred Zusi, Ace Bradley, written and illustrated by Harry Thomson, and Clift Steele and the Mystery of Magon, Part 2, written and illustrated by Adrian Dingle. These depictions of the Canadian heroes illicit a sense of nationalism within Canadians, for they are handsome, tough and embody everything Canadians want to see in both their heroes and within themselves. In stark contrast to the way in which the Canadian heroes were depicted in the Commando Comics, the vilified nations of Japan and Germany were made to look like unintelligent and crude barbarians who were much inferior to the Canadians who always thwarted them. In one of the Bell Features comics, Hitler is portrayed as illiterate fool, speaking in a bad mix of English and German to the people of Germany; “Peoples of der Reichtag, ve haff been informed through der Gestapo that John Canuck is now in der country … he must be found! I vill giff 10,000 marks for him…dead or alive! !” (Heet). This portrays the Germans as illiterate and intellectually inferior to Canadians and the allied nations. 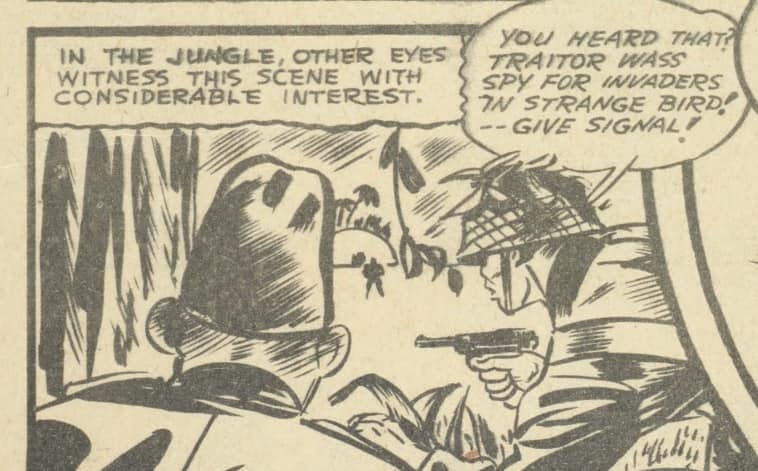 Furthermore, in the 15th issue of Commando Comics, in the story Clift Steele and the Mystery of Magon , the Japanese hiss when they pronounce their ‘s’’s, as shown in the image below (Dingle 6). Dingle, Adrian. Panel from “The Young Commandos.” Commando comics. No. 15, January 1945, Commercial Signs of Canada, p. 13. Bell Features Collection, Library and Archives Canada. Likewise in The Invisible Commando, they cannot form full sentences (Bachle 35). This further perpetuates the idea that the German and Japanese are not only evil, dangerous enemies, but that they are illiterate making them intellectually inferior to the Allies. These crude depictions of the Japanese and Germans seen throughout the 15th edition of Commando Comics not only portray them as unintelligent illiterates, but they also portray the people of those nations as scary, ugly men. In The Young Commandos, Jerry Lazare draws the villain Kato Aomori as a thick headed, buck toothed man who is losing his hair in patches (12). In Clift Steele and the Mystery of Magon, the Japanese villains are depicted as larger men, with hunched over almost buffoonish stances, with bucked teeth and thick necks (Dingle 4-5). These portrayals emphasize the widespread notion during WWII that the Japanese were not only inferior to the Allies in warfare and intellectual standing, but also in physical appearance. This comic book helped perpetuate the propagandistic notion that the Allied nation’s enemy was inferior to them in every way. These notions of Japanese inferiority that the Canadian Whites –including Commando Comics– perpetuated helped give rise to anti Japanese sentiment that was beginning to fester in Canada during the latter half of World War II. In British Columbia the racist colour metaphor know as “Yellow Peril” began to rise, and in 1942 the Canadian government started to detain and dispose of any people of Japanese descent living there. Racism towards the Japanese in Canada was not unheard of before their detainment; laws in British Columbia had previously prevented Japanese peoples from working in mines, from voting and excluded any whom the people of British Columbia declared to be an ‘undesirable’ from being involved with any project funded by the province (Marsh). On December 7th 1941, following attacks on Pearl Harbor and bombings in Hong Kong where Canadian troops were stationed, fears of the Japanese and a possible invasion became heightened throughout Canada, giving rise to their distrust of the Japanese. Japanese schools and newspapers were subsequently shut down, and 1,200 Japanese-owned fishing boats were impounded by the Royal Canadian Navy (Marsh). The racist sentiments held towards the Japanese people were in full effect after the attacks on Pearl Harbor, and propaganda such as the Commando Comics only furthered the Canadians’ belief that the Japanese were crude monsters who deserved to be feared and detained. Because of these fears, on February 24th 1942, Prime Minister William Lyon Mackenzie issued an order to remove “any and all persons” in the country; although those orders were ambiguous enough to allow the detention of any person, the specific target of the issue was the Japanese Canadians, specifically along the West Coast (Marsh). The British Columbia Security Commission was soon established with the purpose of carrying out Japanese internment, and on March 16th the first Japanese Canadians were taken by special trains that brought them to Hastings Park, where eventually more than 8,000 detainees would pass through (Marsh). The anti-Japanese racism was not solely confined to British Columbia, but was spread throughout Canada during WWII. 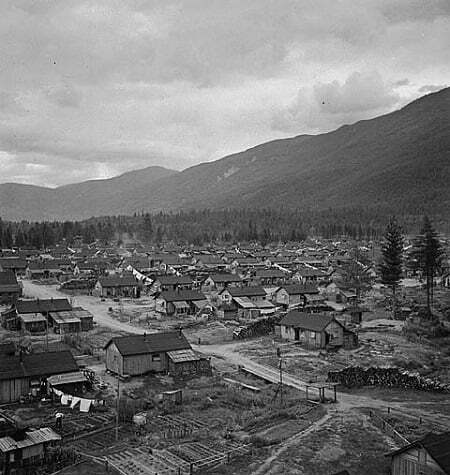 By the end of WWII, over 90 % of Japanese Canadians had been uprooted and displaced and sent to internment camps such as the one seen in the image below. By the end of the war over 21 000 people, most of whom were Canadian citizens by birth, had been interned (Marsh). By the end of the war, Prime Minister King did not show any remorse for the way he and his government had been treating the Japanese Canadians, instead giving them an ultimatum; to move to Japan or to spread to the provinces east of the Rocky Mountains (Marsh). “Japanese Interment Camp in British Columbia.” Photograph. Wikimedia Commons, 2015. Web. 29 Apr. 2017. Ideas that are espoused in Commando Comics issue 15, helped give rise and distribute these extreme anti- Japanese sentiments throughout Canada during WWII. By maintaining that the Japanese were barbaric monsters who were inferior to the Canadians and the Allied Nations in every way, Canadian citizens began to see Japanese Canadians as the crude monsters they were depicted as. Major-General Kenneth Stuart, who served Canada in both World War I and II, wrote that “from the army point of view, I cannot see that Japanese Canadians constitute the slightest menace to national security” (Marsh). Despite those who advocated for the Japanese-Canadians and against the treatment they were receiving from the Canadian government during WWII, Escott Reid who was a Canadian diplomat during the war, said that Canadian politicians due to their rage towards and fear of the Japanese, spoke about them in the way that the Nazis spoke about the Jewish people of Germany. Reid stated, “When they spoke I felt… the physical presence of evil” (Marsh). There was already an anti-Japanese sentiment on the rise throughout Canada during the onset of WWII, and propaganda such as Commando Comics issue 15 only furthered this racist, biased position by distributing crudely drawn and illiterate representations of the Japanese people. Issue no. 15 of Commando Comics not only depicts Japanese people as inferior, but it also portrays the Germans as evil, uneducated villains as well. In Loop The Droop written and illustrated by Harry Brunt, Hitler is depicted as a bumbling buffoon, who scares easily and spends his days in fear of the United Nations. At one point he is waiting around in Berchtesgaden, speaking in a mangled mixture of German and English; “I vunder vot der United Nations haff up dere sleeves now? (sigh)… Diss zuzbenz iz driving me grazy- my nerves iss all on edge!” (Brunt 55-56). This depiction of Germany’s leader, speaking English whilst alone with a poor German accent, perpetuates the notion that Germans are foolish and cannot speak properly making them intellectually inferior to Canadians. Propaganda such as this contributed to German-phobic sentiments during WWII because Canadians were being shown not to fear the Germans, for they were simply scaredy-cats and bumbling idiots. Anti-German sentiments such as this were present before WWII, and were widespread throughout Canada. In World War I for example, an extreme backlash against the Germans and all things German became prominent within Canada. Public schools removed any German curricula from their schools; orchestras refused to play German compositions; and in Winnipeg residents went as far as to change the name ‘hamburger’ to nip so that any association with Germany and the enemy language was eradicated (Anti-German Sentiment). Furthermore, a small town named Berlin in Ontario that was home to many German Canadian citizens became the focus of unease after avid patriots removed a statue of Kaiser Wilhelm I from the centre of the town. In the hopes of eliciting nationalistic feelings the town committee changed its name to Kitchener in 1916 (Anti-German Sentiment). These fears and concerns were being perpetuated through the use of anti-German propaganda. From the beginning of WWI most Canadians demonized the enemy, believing stories from overseas of supposed German war-crimes and accepting without question fabricated German atrocities. The war propaganda being perpetuated throughout Canada convinced Canadians of the Germans’ barbarity and reinforced stereotypes that intentionally obscured the line between fact and fiction (Anti-German Sentiment). This propaganda soon referred to German Kultur as “a damning insult, a predisposition for war, cruelty, and destructiveness” (Anti-German Sentiment). This stamp on German culture placed the Germans outside of a community of civilized nations, depicting them as barbaric and inferior. While Commando Comics issue no. 15 may not reach this level of severity towards the Germans, it still helped perpetuate notions that the Germans were not only inherently evil villains, but also intellectually inferior and therefore easy to defeat in battle. Harsh, unrelenting propaganda such as this, caused Canadians and other Allied nations to look down upon the Germans and regard them as inferior; intellectually, politically and in every other sense of the word. Anti-German propaganda became widespread throughout not only Canada, but in Britain, Australia and the United states as well, reaching extreme proportions (Connors). In the 15th issue of Commando Comics, depicting the Germans as buffoonish clowns who are afraid of their own shadows and who cannot form proper sentences, only further perpetuated these Germanphobic sentiments within Canada. This ultimately caused Canada to not simply fear the Germans, but to mock and loath an entire supposed, barbaric nation. The 15th edition of Commando Comics’ underlying propagandistic tones, perpetuated anti-Japanese and Germanphobic sentiments throughout Canada during WWII. Comic books, meant to delight and entertain are almost always nationalist allegories, and Commando Comics no.15 is no exception. With heroic, handsome depictions of Canadian heroes thwarting crude and barbaric portrayals of the enemy, Canadians began to believe that they were not only instrumental in defeating the Nazis and the Japanese, but that they were far more superior than their enemies. By portraying an entire nation as intellectually and physically inferior, Commando Comics issue no.15 helped contribute and give rise to racist sentiments that became prominent within Canada during World War II. Bachle, Leo (w, a). “The Invisible Commando.” Commando Comics, no. 15, January, 1945, pp. 30-35. Canadian Whites Comic Book Collection, 1941-1946. RULA Archives and Special Collections, Ryerson University, Toronto, Canada. Bell, John. “Comic Books in English Canada.” The Canadian Encyclopedia, 7 Feb. 2006, http://www.thecanadianencyclopedia.ca/en/article/comic-books-in-english-canada/. Accessed 17 Feb. 2017. Brunt, Harry (w, a). “Loop the Droop.” Commando Comics, no. 15, January, 1945, pp. 55-56. Canadian Whites Comic Book Collection, 1941-1946. RULA Archives and Special Collections, Ryerson University, Toronto, Canada. Dingle, Adrian (w, a). “Clift Steele and the Mystery of Magon Pt. 2.” Commando Comics, no. 15, January, 1945, pp. 1-7. Canadian Whites Comic Book Collection, 1941-1946. RULA Archives and Special Collections, Ryerson University, Toronto, Canada. Heet, Jeer. “POW! BLAM! ZOWIE! Eh?” Literary Review of Canada, vol. 75, no.5, June 2007. http://reviewcanada.ca/magazine/2007/06/pow-blam-zowie-eh/. Accessed 19 Feb. 2017. Lazare, Jerry (w, a). “The Young Commandos.” Commando Comics, no. 15, January, 1945, pp. 10-15. Canadian Whites Comic Book Collection, 1941-1946. RULA Archives and Special Collections, Ryerson University, Toronto, Canada. Marsh, James H. “Japanese Internment: Banished and Beyond Tears.” The Canadian Encyclopedia, 23 Feb. 2012, http://www.thecanadianencyclopedia.ca/en/article/japanese-internment-banished-and-beyond-tears-feature/. Accessed 17 Feb. 2017. Thomson, Harry (w, a). “Ace Bradley.” Commando Comics, no. 15, January, 1945, pp. 43-49. Canadian Whites Comic Book Collection, 1941-1946. RULA Archives and Special Collections, Ryerson University, Toronto, Canada. Zusi, Alfred (w, a). “Chick Tucker.” Commando Comics, no. 15, January, 1945, pp. 37-42. Canadian Whites Comic Book Collection, 1941-1946. RULA Archives and Special Collections, Ryerson University, Toronto, Canada.